It started in Long Beach Island, New Jersey, where we driveway camped in the 100 degree heat! We enjoyed celebrating our 14th wedding anniversary while taking in the sights and parades of Philadelphia on the 4th of July. Then we went to work! Traveling into New York where we presented Smartphone and Picasa seminars to computer clubs in West Nyack and Poughkeepsie. Then to Burlington, Vermont for the FMCA NE Area RV Rally. 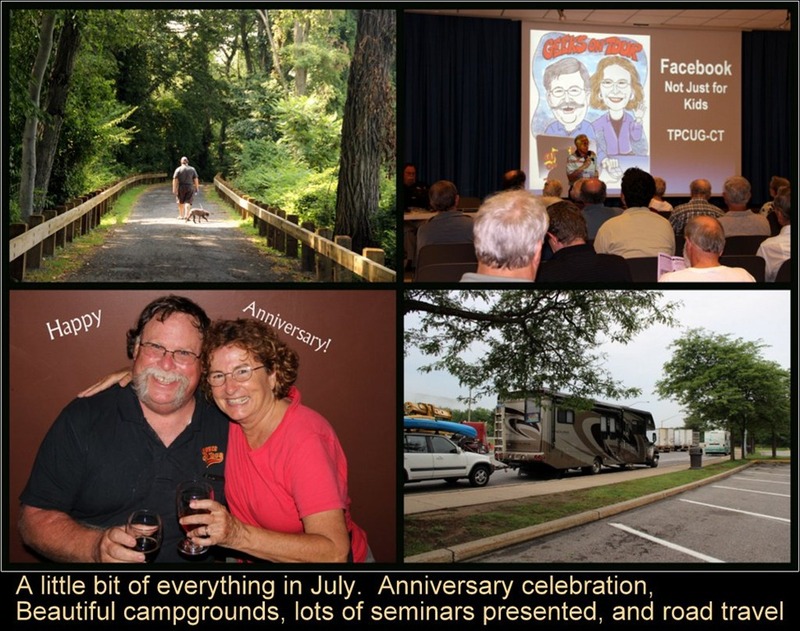 After a week at the RV rally, we traveled south to Milford, Connecticut to present a seminar on Facebook to the Computer User Group there. Now we are in Michigan, after a long highway drive and a night at a rest area. This week we’ll be on the learning end of some seminars at Screencast Camp, where we’ll learn more about using Camtasia 8 for creating our tutorial videos. Aug 21: Smartphone Seminar for Quad-Cities Computer Club Moline, Illinois. Aug 22: Public Hands-on Picasa class in Davenport, Iowa at the Center for Active Seniors. 3 hrs/$30 Register here. Aug 27-30: FMCA RV convention in Indianapolis. Presenting 8 seminars and 2 hands-on classes (Picasa and Smartphones) Hands-on classes require pre-registration at the rally 8am on the first day. As we travel by RV, we’ve gathered lots of different sources for finding places to park and stay. Our favorite is the Streets and Trips program, with the POI Megafile. 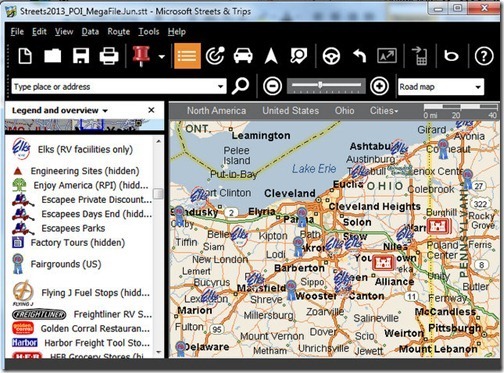 This is a file that is used in combination with Microsoft’s Streets and Trips program. POI stands for Points of Interest. It is currently a compilation of 220 categories, containing thousands of points of interest. 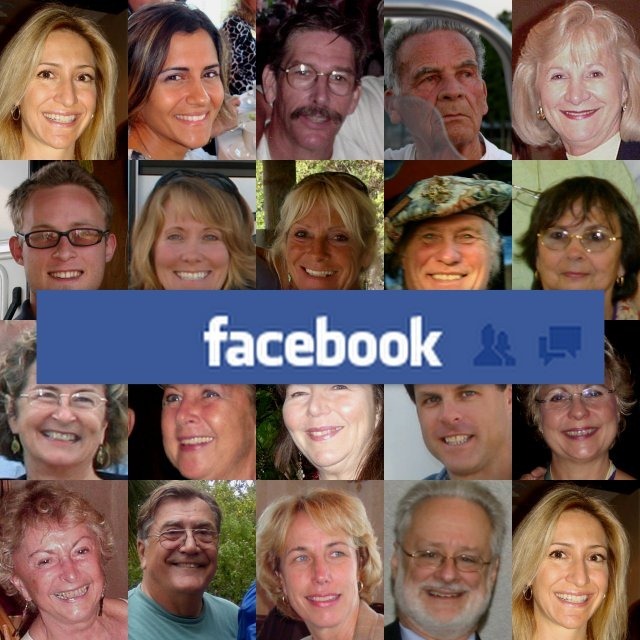 Many of them are very near and dear to RVers . That includes campgrounds like Thousand Trails that usually do not show up on other lists because it requires a membership. Same thing with Elks Lodges that offer RV parking for their members. You can download this POI Megafile for free. It is updated every month or so. The current file is meant for the S&T 2013 program and it is dated June. It is specifically made for MS Streets and Trips. If you don’t use Streets and Trips, you are limited to downloading individual sets of POIs yourself from places like Discovery Owners. Each set of data is called a Pushpin Set and once you’re viewing Streets and Trips, you have the option to Show or Hide any given pushpin set. Look at the image above. The list of pushpin sets from the Megafile are showing on the left side, if you scroll up or down, you’ll find all 220 sets. Pick one you want to see, right-click on it and choose ‘Show Pushpin Set.’ In the example, I have chosen to Show Elks Lodges, Corps of Engineer parks, and Fairgrounds. They each have their own unique icon and are very recognizable as you look on your map. We are currently in New England. The northeast has more low bridges and other RV unfriendly roads than other parts of the country. Sometimes it is just so much more efficient to view a slideshow than to have numerous pictures posted on your page. Published by MrsGeek, in Newsletter. Tagged with Facebook Do's and Don'ts, Geeks on Tour News, POI Megafile, Quad-Cities, Screencast Camp, Slideshow in your blog.